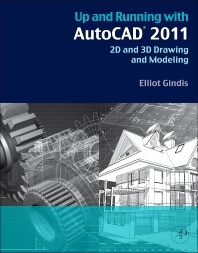 Up and Running with AutoCAD 2011: 2D and 3D Drawing and Modeling provides an introduction to the fundamental concepts of AutoCAD. These concepts have been distilled down to basic, easy to understand explanations for the benefit of beginner students. Each chapter explains the new concept or command and why it is important. Readers are given the chance to apply just-learned knowledge to a real-life exercise, drawing, or model. They can also test their knowledge with end-of-chapter quizzes and drawing exercises. The book is organized into three parts: Level 1, Level 2, and Level 3. Level 1 offers a wide breadth of knowledge on many topics. Its chapters comprise the complete essential knowledge set of an intermediate user. Students can then work on, if not necessarily set up and manage, moderate to complex drawings. Level 2 is meant for advanced users who are CAD managers, full-time AutoCAD draftspersons, architects, or self-employed and must do everything themselves. The goal here is depth, and several features not deemed critically important in Level 1 are revisited to explore additional advanced options. Also introduced are advanced topics necessary to set up and manage complex drawings. Level 3 is all about 3D. Solid knowledge of the previous two levels is highly recommended before starting these chapters. The 3D material covers all aspects of AutoCAD solid modeling, including lights and rendering. Beginner through advanced users of AutoCAD. Architectural engineers, drafting, civil/construction engineers, mechanical engineers. Students taking drafting/engineering drawing courses in engineering and engineering technology programs. Appendix H What Are Kernels?